SEOUL — The Presbyterian Peacemaking Program’s 2018 Korea Travel Study Seminar concluded Friday with discussions on the group’s work over the last 11 days and plans for incorporating gained knowledge into Presbyterian contexts. Eight participants joined mission co-workers Hyeyoung Lee and Kurt Esslinger, along with Carl Horton, coordinator for mission with the Presbyterian Peacemaking Program, as they continued to learn, experience, worship and reflect on peacemaking and reconciliation efforts on the peninsula. A rigorous schedule dictated the final four days of the group’s trip in Korea, including a visit to the Border Peace School and the Demilitarized Zone (DMZ), presentations by leading scholars on the Korean peacemaking process, participation in the weekly protest seeking recognition and recompense for Korean “comfort women,” and a visit to the No Gun Ri memorial. On the way to visit the DMZ,seminar participants stopped at Soi Mountain, a spiritual destination at a former US military observation installation. Taking a prayerful walk up the mountain, group members held a devotion at the top as they overlooked the landscape of the DMZ and the Korean War. A presentation at the Cheorwon Border Peace School in the shadow of DMZ fortifications, led by the Rev. 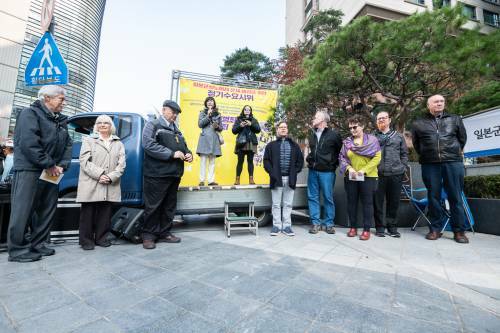 Dr. Jung Ji-Seok of the Presbyterian Church in the Republic of Korea (PROK), encouraged participants to hear the story of those urging peace on the Korean peninsula. He warned against vilification of North Korea by western nations and urged dialog with Koreans who find great hope in the recent meetings of North and South Korean leaders. Climbing one final hill — on which the White Horse Hill memorial is located — participants took in an expansive view of the Civilian Control Zone, the 4 kilometer (2.5 mile) forested DMZ, and the soaring mountain ranges of North Korea. Named after a regularly contested hill visible from the summit, White Horse Hill (Baengma-goji) was so heavily bombed that, viewed from the air, its form changed to resemble a horse lying down, covered with the white remnants of mortar rounds. Having learned about Korean “comfort women” — girls and women taken by Japanese occupiers prior to the end of WWII and forced into sexual slavery to service Japanese military — and experienced the “War and Women’s Human Rights Museum,” seminar participants took part in the weekly protest at the Japanese embassy in Seoul seeking an apology and reparations for damages done. Now in its 28th year, the protest included several hundred people gathered Wednesday morning to demand justice for these women and oppressed women around the world. On Thursday, the group visited No Gun Ri, the site of a massacre of Korean civilians by US soldiers at the beginning of the Korean war. Believing the civilians to be communists, the US military killed 250-300 people, mostly women and children, during the July 26-29, 1950 attack as they sought shelter under a railroad bridge. In November 2017, Presbyterian Church (U.S.A.) Stated Clerk, the Rev. Dr. J. Herbert Nelson, II, visited No Gun Ri in response to Overture 12-01 and Commissioner’s Resolution 12-13, adopted at the PC(USA) General Assembly 222 (2016) in Portland, focusing on the reunification of the Korean Peninsula and the need to build upon the increasing momentum toward peace. Travel Study Seminar participants concluded their experience with small group processing and considering the question, “What can come out of this learning experience?” Previous seminars have been active in advocacy, mission network participation and overture drafting on justice issues to be recognized by the PC(USA) General Assembly. Upcoming Presbyterian Peacemaking Travel Study Seminars are planned for Rwanda, Ukraine and Russia, the Central American Migrant Trail, and the Philippines and Hong Kong. More details are available on the Travel Study Seminar web page.